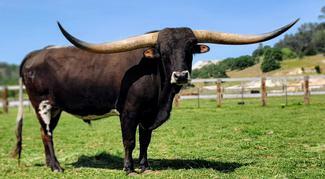 bulls, breeding, gentle steers, show cattle, cow calf pairs, beef and ropers. Tuff Test is a Cowboy Tuff Chex and Bowl of Roses son. He is big, deep, wide and gentle, siring healthy, very colorful calves with great structure and horns. At just 4 years of age, he is still maturing and we can't wait to see the whole story! Rusty Shade Iron is our Drag Iron son out of the super-pretty mama Shady Smile, who has the most perfect horns we've ever seen. Rusty is a slightly wounded warrior, having lost his right tip in a gentleman's discussion, but we think gives him a kind of bad boy look. Look at his left side and remember he is just a little over 2 years old! This show- stopping brindle color is being faithfully reproduced in his first calves, and despite the somewhat biker look, he is the gentlest bull on the ranch. Westhaven Fast Win is our Clear Win and Fast Jube son, with the amazing Shadow Jubilee - one of the widest horned and gorgeus cows ever - on his mama's side. 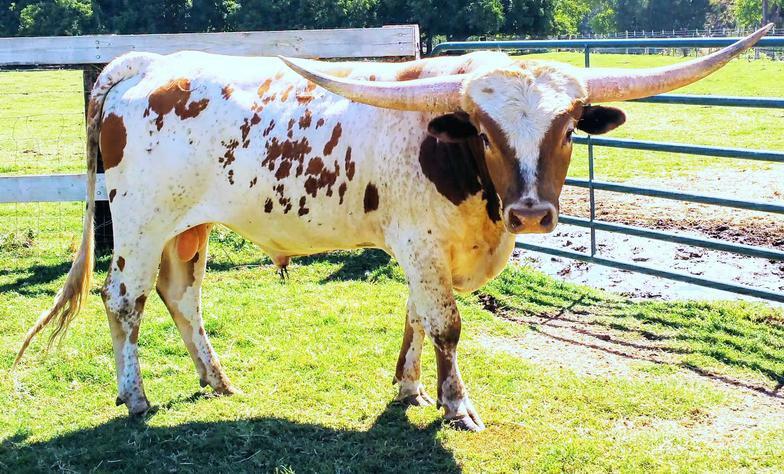 This 2 -year old bull is breathtaking not just for the width, shape and base size of his horns, but for his clean, well sprung girth, big hips and textbook top and bottom lines. We think the keyhole marking on his face foretells a golden future. We are super excited to be welcoming his first calves this year.